In the previous post, we have review several best free video cropper online tools to help users crop and resize a video efficiently and swiftly. Yet, if you're not happy with these online video croppers due to its privacy leakage possibility or poor network connectivity issue, you can consider some desktop video cropper freeware instead. To save your time and efforts, we're going to introduce top 6 best free video cropper software for users to crop videos on Windows and Mac computers with ease. 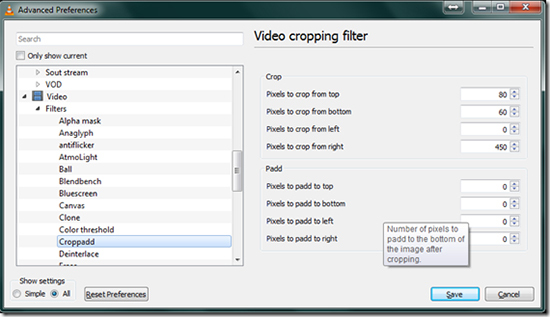 As the name suggest, Free Crop Video is a 100% free video cropper freeware that can be used to crop any format videos extremely easily. It is a simple solution specially for cropping videos. Cropping videos with Free Crop Video only needs 3 simple steps: you first launch the program and press the "+" button to add source video files; select a video and click the "Crop" button to crop a video; then press the "Settings" button to choose an output format and click the "Render" button to get the new video files. If you're a macOS user, you can adopt iMovie to crop video file handily. 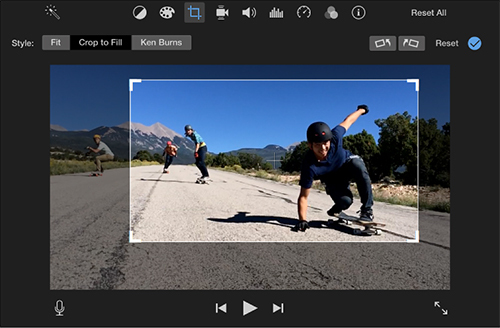 Apple's iMovie is a free video cropper Mac users will adore it. With the app, you can easily crop a video in a straightforward way. Just run iMovie, import the target video file, press the "Crop" icon and then start to crop the video clip until you get the satisfied result and save it. Besides cropping, iMovie also works as an incredible video editor that can edit and create wonderful footages on Mac, iPhone and iPad as well. 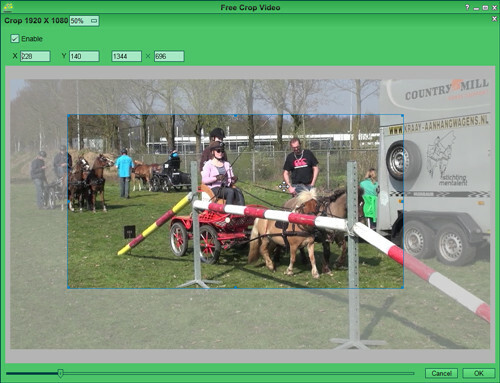 Another free video cropping tool introduced here is VSDC Free Video Editor. You can use it to crop unwanted borders in video or images easily. After importing the video you want to crop, you just need to pick the "Crop borders" option in object properties or object menu; then preview and mark the region for cropping, or manually enter the border size value (left, top, right, and bottom) to be removed in object properties; click the "Ok" button and borders will be cropped. 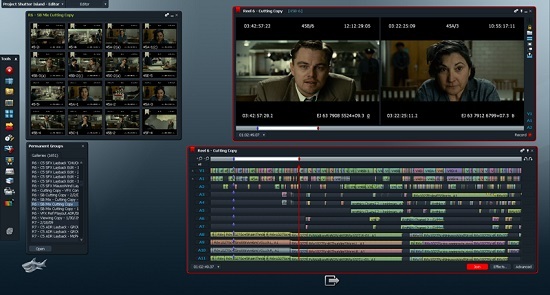 Additionally, VSDC Free Video Editor also offers various other editing features with multiple visual and audio effects, etc. Avidemux is a free open-source video editor for simple cutting, trimming, filtering and encoding tasks. Among many filters is the Crop tool that can be used to crop videos, remove unwanted or black borders from the video files. After going to "Video" > "Filters", you need to find the "Crop" option by pressing the green plus button, and then enter the pixel values from left, right, top and bottom manually or just use the Auto crop feature to detect any black lines for cropping. Avidemux also supports many different files types including AVI, MPEG, MP4 and ASF. 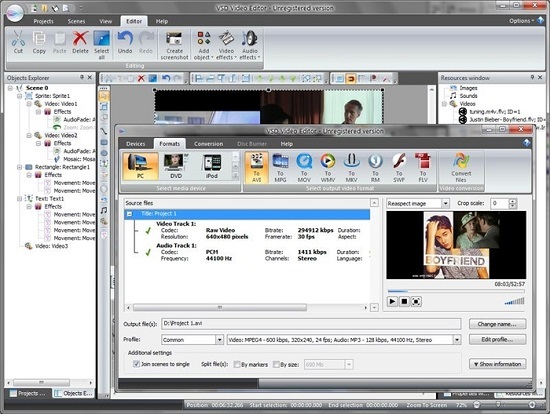 This is an open-source free multimedia player, yet it also performs well in cropping videos. However, many people may don't know how to use VLC media player to crop videos, and it may seem a little complicated. You need to add a target video to the program first to determine the area to be cropped, and then set the preferences and filters for cropping the target video file, since there is no preview available during the cropping process. Recommend you to get some detailed guides on the Internet before using the tool to crop the video. 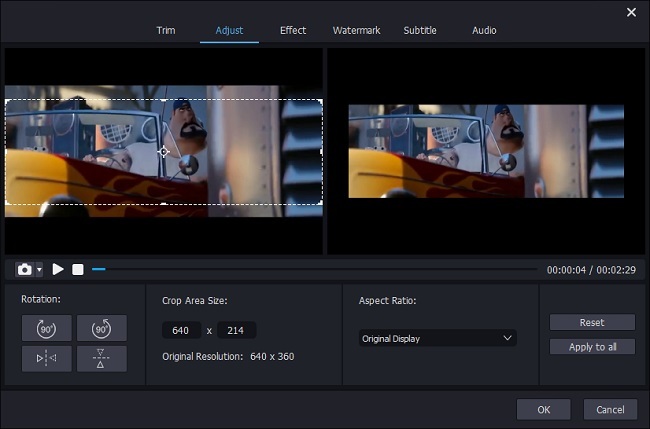 Lightworks is a free video editor with professional editing tools, and of course you can use it to crop video free of charge. After getting the free video cropper download, install it on the computer, add the target video to Lightworks, and go to Effects > DVE, and there you have five options: Position, Scale, Crop, Shadow and Opacity. Choose the "Crop" tool and move the handles to crop the video as you like. You're offered a preview window while cropping the video file, so you can see clearly every change you made to the video clip. Lightworks is packed with many other editing features, but it seems that the tutorials are a few. Although these free video croppers can crop videos effectively, yet if you care about the quality of cropped videos, you can consider this smart and professional desktop video cropper named Joyoshare Media Cutter. Available for both Windows and Mac, Joyoshare Video Cropper allows you to crop the video at a fairly fast speed with high quality preserved. You can just move the cropping frames or manually enter the pixel values for the new video. 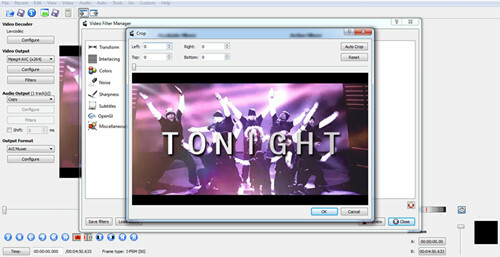 More importantly, the program offers two preview windows for you to see any change you made to the clip in real time. You can also add more edits to your videos if needed, such as apply effects, insert watermarks and subtitles, etc.